Many apps have been trying to take on Skype — among them Viber and recently, messaging app Line which launched a cheap calling service. 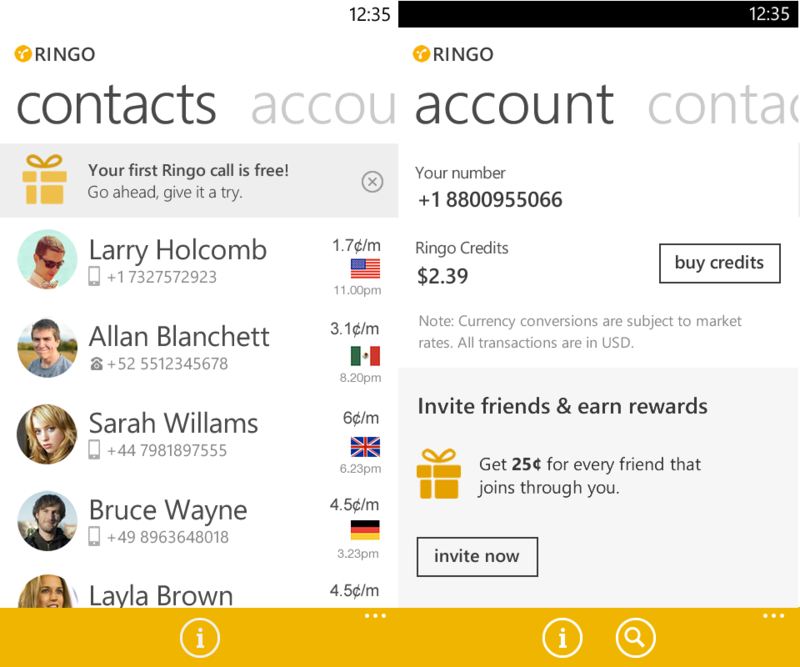 Now another app has surfaced, called Ringo. What’s notable is that the app doesn’t need Internet connection for you to make calls. Essentially, this means that the Ringo app has the ability to route calls just like the way a regular carrier does, so “calls are not affected by fluctuations in internet connectivity that often lead to audio delays, loss of quality and dropped calls.” The company also notes that the phone number you make your call from will continue to appear as the caller ID. What’s more, Ringo claims that the costs to make a call on its app are lower than “popular calling apps” — a very obvious stab at Skype. At launch, Ringo will be offering an 80 percent discount on calling rates to US mobile phones, making for a rate of $0.003 per minute, down from the usual of $0.017 per minute. For comparison, Skype charges $0.023 per minute for a call to the US, excluding a connection fee of $0.049. Ringo is now available for iOS, Android and Windows Phone devices in 16 countries: Australia, Belgium, Brazil, Canada, Germany, Hong Kong, Italy, Japan, Mexico, Netherlands, Poland, Singapore, Spain, Switzerland, UK and US. Users on Ringo in these countries can make calls to any destination worldwide. Ringo sounds like a promising app, but it could threaten not only rival calling apps, but carriers too — and there’s no certainty that carriers will take it lying down. Whether Ringo can spark a change in the calling system just like messaging apps destroyed SMS remains to be seen, but if the quality of calls are good and there are no technical issues with the app, carriers should watch out.